The Germans Greens turn 30 years-old today. 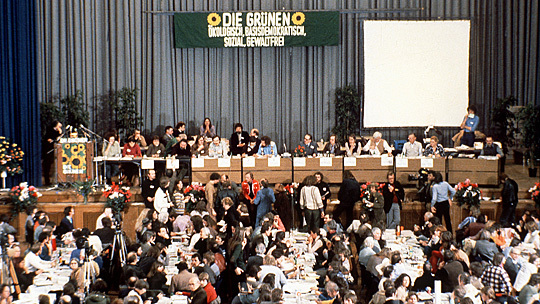 At a conference in Karlsruhe on January 13, 1980 (above), a heterogenous group of left-wing and right-wing environmental activists who had already co-operated in electoral lists for several years, finally took the plunge and created a party (or rather an “anti-party”, as Petra Kelly called it). It wasn’t the first Green party in Europe (Britain’s Ecology Party, for example, had existed since 1973) but it soon emerged as the most powerful. It has had an enormous impact in Germany over the last thirty years, above all in forcing other parties across the political spectrum to take environmental issues more seriously and in particular in phasing out nuclear power. And yet it has in a sense been a victim of its own success. At a time when the environment is higher on the political agenda than ever before, the Greens paradoxically slipped into fifth place in last September’s general election, even though they won a record 10.7% of the vote. Now back in opposition again after seven years in government in the “red-green” coalition from 1998 to 2005, the Greens find themselves at an interesting crossroads. The party whose “realists” and “fundamentalists” spent much of the eighties squabbling over whether they should form coalitions with the Social Democrats is now open to the idea of forming coalitions with the Christian Democrats as well. After going through another tortuous debate about NATO and “out-of-area” military interventions (which I describe in depth in my book, Utopia or Auschwitz), it also ended up fighting two wars in Kosovo and Afghanistan while in government. The big question now is: what do the Greens stand for? If you read German, there are interesting analyses today in Die Zeit and, of course, the taz. This entry was posted in German politics and tagged Germany, Greens. Bookmark the permalink.